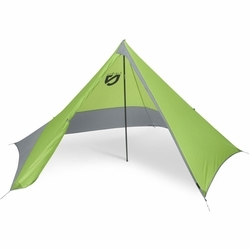 NEMO Apollo 3P Bikepacking Tent. With no floor and simple single wall construction, Apollo™ is the go-to shelter specifically made for bikepackers. It packs remarkably small and can fit into the crevices of your bike’s soft bags. Works independently as a versatile all-season shelter, or as a system with the Escape Pod™ bug bivy and Moonwalk™ sleeping bag.